In Sploland this morning, I stood in the middle of Moucault’s Pendulum, threw out the idea of all being ephemeral and thought about slowing things down. I remembered one of the first exhibitions I attended in SL in 2007 – Brian Eno’s 77 Million Paintings (which also took place in the actual world at Yerba Buena Center for the Arts). The work is made up of three hundred hand-drawn images which are cut up using self-generating software to form an infinite number of variations that will take years to witness. The exhibition was sponsored by the Long Now Foundation (Eno is a founding member), which is best known for its invention of a 10,000 year working clock which will stand as a monument and “provide a counterpoint to today's ‘faster/cheaper’ mind set and promote ‘slower/better’ thinking." I’d love to see a model of this clock in SL. The visual artists aren’t the only ones slowing things down. John Cage adapted his work ASLSP (“as slow as possible”) for solo piano into Organ²/ASLSP. Some have taken the composer's edict quite plainly. A performance of the work, in Halberstadt, Germany, which began in 2001, is scheduled to end in the year 2640. One sound, or pause, will stretch two or three years - the first chord was struck in 2003 and ended in 2005. 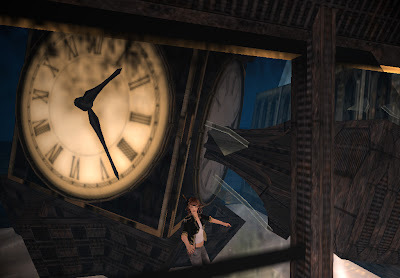 I ended my morning musing floating...slooooowly.....around an ancient ruined clock tower that had been smashed to bits by a steely robotic arm.